Hi friends! October is a really hard month for the stamping and paper crafting community. I find that I just can't walk about from these causes especially when such a small contribution is asked from you. Not too long ago, I saw a post about the owner of Simply Betty Stamps and how her son has cancer and needs surgery. Though Christian should make it through his surgery and be just fine, the family needs some financial help getting him the surgery. As a mom, I couldn't turn away from this. If one of my kids needed a surgery, I wouldn't know what to do. We don't have the means to cover that. 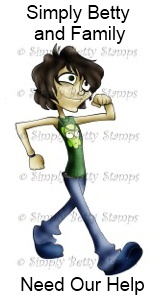 I bought a digi stamp to go into their fund. Though it was only a few dollars, I hope it helps a bit. For more info, go HERE. Here's the card I made with Simply Betty's Pumpkin Mickey Hat Betty. I LOVE this super cute image! Isn't she a doll? I combined this card with a couple challenges. 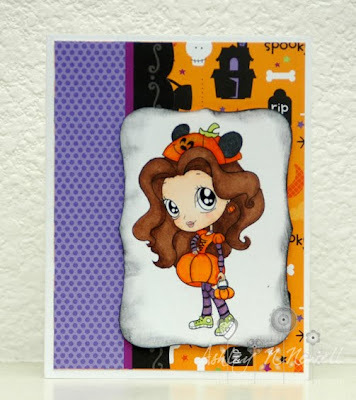 I used Paper Works Co sketch #101, Wee Memories Challenge #71 to make a Halloween card, and Shop Our Stash #21 to use black and orange. The paper is Doodlebug and I colored with Copics. *sigh* I know what you mean about it being a hard/sad month for the paper crafting community. so great of you to join in on those blog hops and buying simply betty. i can't imagine what they are going through. your card is beautiful! i'm off to check out betty's store now. Beautiful coloring, beautiful image and great cause!! She is SO super cute Ashley! LOVE your coloring. There is so much sadness going on in our community...what a great cause. So very cute!! Great card! Thanks for playing along with Shopping Our Stash! oh goodness sakes! Your coloring of this cute image is amazing! Thanks for playing along with Wee Memories Ashley! Wow! Fabulous coloring. Thanks for playing with us at Wee Memories! Super cute. Thanks for playing with PWCO. What a cute card! I love how you colored the cute image! Thanks for joining us at Shopping Our Stash! So cute! I love your colouring, Ashley. I forgot to mention thank you for joining us at PWCO! Fab work as usual, girlie!